In the southern part of Kii peninsula, in Wakayama prefecture’s Nachi-Katsuura town there is a hotel which will remind you of the mythological dragon palace under the sea. It’s named Hotel Urashima. One of its prominent features is the open-air bath made inside a big stone cave called “Bokido”. The entire island looks as if it’s part of the hotel and you will find 6 different hot springs that you can visit during your stay. Wouldn’t you want to try the unique experience of bathing in a stone cave created by the waves of the stormy sea? Momijiya in Nassa Onsen. Wakayama's famous onsen! A cute turtle takes you to the island almost like in the fairytale of the dragon palace under the sea! Katsuura Bay is known for the biggest catch of maguro tuna fish with long cords in Japan. Plenty of little islands are scattered around the bay similarly to Matsushima near Sendai. Hotel Urashima is located at the tip of one of the peninsulas which embrace the bay. The access to the hotel is by a short and free-of-charge boat trip. As you can see on the photo, the boat resembles a cute turtle. This ride will feel like the ride to the undersea dragon palace from the popular Japanese folktale. The trip is pleasant and emotional, and you will instantly fall in love with the cute turtle boat. Blown by the sea breeze, you’ll forget about your daily worries and will arrive to your destination. The 5-minute boat trip starts at Katsuura’s wharf and ends at Hotel Urashima. 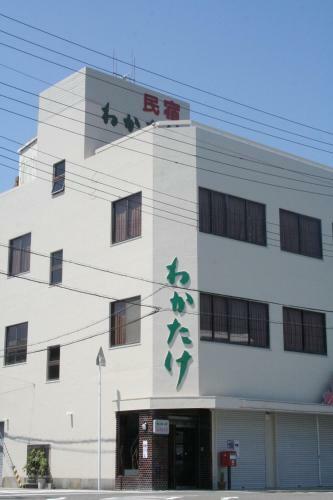 The hotel itself consists of four buildings – the main one, Nagisa building, Sanjo building and Nissho building. It’s an ideal destination not only for couples and families with kids, but also for incentive tours and parties. You can choose between different accommodation options based on your preferences and budget. Accommodation with dinner limits the time for sightseeing and lunch, therefore I opted for the 1-night with breakfast and no dinner plan in Nissho building. It was during the busy Obon period in August, but I still paid only 9200 JPY. Cheap! For dinner you can have a buffet style with lots of maguro tuna fish and Japanese delicacies using local ingredients. But you are free to have dinner also at the hotel’s bar or food stalls. There is also a beautiful vermillion Shinto shrine inside and a splendid souvenir shop where you can buy gems, Japanese paper, seafood and rare accessories. But that’s not all! You will also find a bar, manga café, massage studio, karaoke, game corners and even a pool and a place for fishing (only in summer). The hotel really feels like the undersea palace of the dragon where you will never be bored. Hotel Urashima was opened in 1956. It’s a giant hot spring resort with 800 rooms (accommodating a total of 3000 people). The hotel is so big that you can easily get lost inside. There are 6 hot springs and it will take you more than 40 minutes just to go to all of them. The hot spring water is rich in sulfur, thick and rather hot with its 50 degrees. It’s good for the skin and for recovering from exhaustion. The most interesting hot spring among the six is the natural open-air bath inside a cave called Bokido. Built inside a cave created by the waves’ eroding effect on the rocks, it actually consists of 7 separate baths. Soaking in the water here is a unique experience as you watch the rocky walls and ceiling and hear the sound of the splashing waves. This is a freely flowing hot spring with colorless transparent water which sometimes gets muddy depending on the temperature and the weather. In this hot spring cave you can truly enjoy the real nature. Bokido’s name was given by Tokukagawa Yorimichi, the feudal lord of Kishu province, when he visited this hot spring. As the name suggests, you will feel so nice that you will forget to leave. Relax in the water and you’ll understand how Yorimichi felt. However, be prepared to be splashed by the waves while watching the blue sea. Men and women can enter here in changing shifts. You might want to take a picture of this unique place, but unfortunately photo shoots inside the cave hot spring are prohibited. I asked the hotel for a permission to use one of their photos, but it doesn’t convey well the brilliance of this hot spring. Go there yourself and immerse your body and soul in the beauty of the cave water. From Nisshokan’s room you can see the vast blue ocean and its waves hitting the rocks. There are pine trees growing on the cliffs, so the entire landscape is a typical Japanese coastline picture of white sand and green pines. You might even see the Japanese female divers going underwater to collect seaweeds and shells. As you enjoy this view, you will start feeling as if the pleasant breeze and the smell of the ocean are permeating through the window. This is how pleasant the view is. But the first thing to do after you arrive at this hotel is to go to the hot springs. As I mentioned earlier, there are many of them, for example the cave hot spring Bokido, another cave hot spring Genbudo, the therapy hot spring Iso no Yu, the men-only Taki no Yu, the women-only Hamayu no Yu, the Yoho no Yu which is located on the top of the hill at 80 meters above the sea level, and Tenkai no Yu which provides a beautiful panorama view. Although the resort is quite big, you can try and visit all hot springs. Many visitors do it, walking around with towels in their hands. This is an exciting hot spring tour that will make you forget about everything else. You can even come on a day trip to the hot springs of Hotel Urashima. It costs 1000 JPY and for that price you can enjoy all of them! Cheap! Yoho no Yu hot spring is located in Sanjokan building on the top of a steep hill that you can climb with an escalator. As you can see on the photo, this escalator is very long and is one of the symbols of Hotel Urashima. It’s named “Space Walker” and has an angle of inclination of 30 degrees. The entire length of the escalator is 154 meters and the elevation difference is 77 meters. Personally I’ve never seen a hotel with such a long escalator. In stairs this is equal to 428 stairs and it takes 5 minutes and 45 seconds to reach the top with this escalator. There’s a rest space midway where you can enjoy the view to Katsuura bay and feel like you’re in the fairytale palace. On the top of the hill is Sanjo building. From its roof you can see the entire Katsuura bay as well as the sacred mountains of Nachi. The setting sun behind the mountains is very beautiful and so is the shining view of the bay town at night. You can enjoy an open-air hot spring while watching this panorama. Coming here on a day trip is fine, but I recommend staying overnight, touring all the hot springs of the resort and experiencing the sunrise during an early bath. The sun will slowly emerge over the giant ocean. It will color the small islands in bright golden light and you will never forget this magical view. Welcome the sunrise at the cave hot spring Bokido with a towel over your head and you will truly feel like in the paradise. You will want to stay in this hot spring paradise longer, but just like in the fairytale, you can’t reside in the dragon palace forever. Simply because you’ll forget about reality and will lose your willingness to work. At Bokido hot spring cave you can relax from exhaustion, just like the ancient noble people from the Heian period did after their visit to Kumano’s three famous shrines (Hongu Taisha, Hayatama Tasha and Nachi Taisha). During the period of two imperial dynasties the commander of the southern dynasty Ishido Yoshinori led the battleships in this cave and barricaded himself with his army inside. It was a great opportunity to experience a relaxing hot spring amidst the turbulent war times. Here you can indeed forget about reality. You will think that you want to come back as you’re riding the turtle boat and leaving the palace of the dragon to return back to Katsuura Bay. But how about buying some souvenirs from your trip to Hotel Urashima? I recommend “Bokido-Monogatari” and “Ika-Matsuri”. They’re both symbolic sweets for this hotel. “Bokido-Monogatari” is a rice cracker with vanilla cream inside. It’s nice and sweet. “Ika-Matsuri” is another rice cracker with a shrimp favor. It’s slightly spicy and goes well with sake. Kii-Katsuura is the second most famous hot spring resort in Wakayama prefecture after Shirahama Onsen. If you visit the World Cultural Heritage Site of Kumano and its three sacred shrines, be sure to stop by Katsuura as well. The nearest station is Kii-Katsuura and it’s easily accessible from Kyoto, Osaka and Nagoya with a limited express train. Come with a train and rent a car within the town. At Katsuura you can eat inexpensive and delicious maguro tuna dishes. After an abundant lunch with maguro tuna the best thing to do is to relax at Bokido hot spring cave. Nanki-Katsuura Onsen “Hotel Urashima” Address: Wakayama prefecture, Higashimuro-gun, Nachi-Katsuura town 1165-2 Telephone: 0735-52-1011 Hot spring quality: sulfuric, sodium-calcium chloride water, low alkaline, high temperature Day trip hot spring time: Different opening time for every hot spring. Check in advance. Facilities: Gender-divided open-air baths, gender-divided indoor baths, summer pool, restaurants, shopping centers.